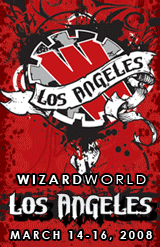 Wizard World Los Angeles turned out to be a surprisingly good con. 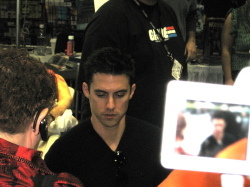 Originally I was planning to go on my own, but when they announced the addition of Milo Ventimiglia (Peter Petrelli) to the Heroes panel, Katie decided to go as well. So we drove into LA Saturday morning, and arrived at the con around 11:00 AM. I was expecting a much sparser crowd based on my experience last year, but that had been a Sunday. This Saturday was a full-fledged con. Update: The photo gallery is up! 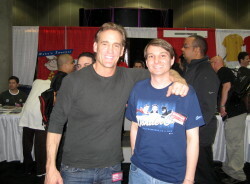 I spent most of the time on the main floor, hunting down back-issues, bargains and autographs. A lot of dealers had brought their bargain bins (some of them, thankfully, alphabetized! ), and a lot of them had trades and hardcovers for half-off or close to it. There were also the booths selling high-grade Silver-Age and Golden-Age books, toys and collectibles, and at least two booths selling swords. Yes, swords. At one point, I overheard two comic-book dealers discussing whether the show was worth it. One of them said that people here tended to be looking for bargains, so it was hard to sell anything else. They agreed San Diego was a better bet. I’ve been joking that the logo design for this year’s con (see above) was inspired by the gigantic auto show that shared the convention center witl last year’s con. 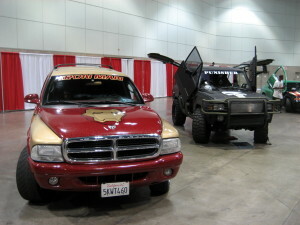 So I was surprised to find a mini-auto show here: Marvel-themed cars, including Iron Man and Punisher SUVs. There was a stage set up for Guitar Hero. At one point, I noticed the music was Metallica’s “Enter Sandman.” It seemed appropriate. 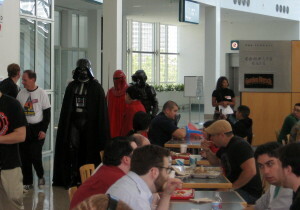 There weren’t quite as many people in costume as I saw at WonderCon last month (also a Saturday). But there was a large contingent of people in Jedi costumes, some of whom seemed to be sparring with lightsabers every time I walked down the right edge of the dealers’ room. And there were Imperial Stormtroopers directing traffic, making sure people could find the one large panel room that was half-way to the other end of the convention center. They held an informal costume contest at 1:00, with winners chosen by applause volume. To avoid interference from the “awwww” factor, they held two: one for kids, and one for adults. The kids’ entries consisted of two groups, one of DC characters (Robin, Harley Quinn, and someone else), and one of Star Wars characters (a Jawa, Leia, and someone else. Gee, my brain’s really working here). The Star Wars group won handily. The weird thing is that the prizes for the kids’ contest were the same as the prizes for the adult contest: mini-statuettes and busts of characters like Hulk, Venom, etc. I can’t imagine the two-to-six–year-olds who won were terribly pleased with their prizes. The parents have probably listed them on eBay already. Once again, there were no placards provided in Artist’s Alley, but a lot of the artists had made their own. I finally managed to track down Josh Middleton, whom I’d looked for at San Diego last summer, and got him to sign my copy of All-Flash #1 (the new one, obviously!) We agreed it was really disappointing that DC had printed it so dark, but he said my copy was actually in the middle of the range! Some of them were even harder to see! I seriously considered buying a print (not that I have anywhere to put it), but while I was there he told someone else that only the pieces up on the board behind him were available—and it wasn’t on the board. Though I have to admit considering his River from Serenity: Those Left Behind. While looking for Marv Wolfman (since I missed my chance to get the Crisis on Infinite Earths novel signed two years ago, I’ve been unable to catch him again at a signing), I saw recognized Mark Evanier standing on the other side of the row, talking to someone who I thought could have been Peter David. 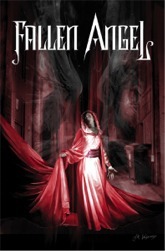 I walked around, saw it was him, and pulled out my copy of Fallen Angel #1 to get signed. He asked me if I was still reading the series at IDW. I said yes, I was, and he pointed out that J.K. Woodward was at the table next to him. D’oh! I hadn’t realized he was coming, so when I was putting together stuff to get signed, I only grabbed the first DC issue of the book, instead of the first IDW issue! We talked a bit about the current storyline, and I got to see some of the original art for the next issue. It turns out he’s doing a couple of signings in the next few weeks, so I might try to catch him at one of those. I’ve noticed some common threads among the celebrity signing areas. Lou Ferrigno seems to do a full circuit of cons, as does the actor who played the original Boomer on the 1970s Battlestar Galactica. Several of the contestants from Who Wants to Be A Super-Hero seem to be making the rounds this year. One set of autographs I wanted to get, but couldn’t, was Seth Green and Hugh Sterbakov. I’d brought my copy of the first Freshman trade, and went over to the Top Cow booth 10 minutes before the signing. Only one problem: The program book had neglected to mention that the signing required tickets, which had been handed out at the Top Cow panel 2 hours earlier. Added: I did, however, find myself walking past the Golden Apple booth during the Pathology signing. I wasn’t sure whether Katie was in the incredibly long line (she wasn’t, as she’d had the same problem with unpublicized tickets that I later had for Freshmen), but I figured I’d try to snap a couple of shots of Milo for her as I walked past. Or, more accurately, shuffled past. The crowd was so thick that I basically couldn’t move for five minutes. I could barely see him, and couldn’t see anyone else at the booth. At least Michael Weston was supposed to be there, but I couldn’t tell. (Not that I would have recognized him.) (Edit: Apparently Alyssa Milano was sitting right next to him—probably straight through that other camera—but I couldn’t see her at all, even in the photos.) 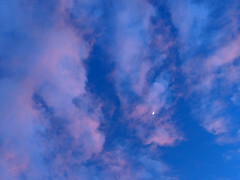 But one nice thing about digital cameras: you can afford to take pictures without aiming. It seemed like everyone in the crowd was reaching up with a camera. The main problem I had with the convention was hidden information. 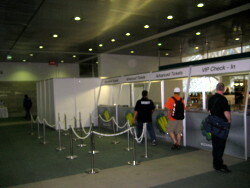 I’ve mentioned the lack of placards in Artists’ Alley two years running, and the unannounced signing tickets. There weren’t any placards at the panels, either, so if you didn’t recognize someone by sight and couldn’t catch their name at the beginning of the panel, you were out of luck trying to figure out who they were. Another problem was the map: it showed the dealer’s room in great detail, and the hallway with most of the panel rooms, but it didn’t show how to get from one to the other. 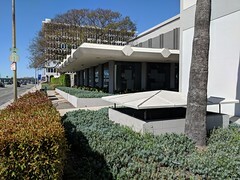 It also didn’t show how to find Petree Hall, which turned out to be not only halfway to the other convention center, but directly above a street. Check the website on your cell phone, assuming you’ve got an iPhone or Opera Mini or something else that can handle it. Scout out the old room more than an hour before you thought the panel was going to start. We were fine, but there must have been a few people who showed up an hour late to the wrong room. After the Heroes panel, we did a quick circuit of the dealers’ room. I wanted to pick up the Anna Mercury book (success) and check one more time for Marv Wolfman (no luck). We left around 6:30, during some sort of giveaway at the Marvel booth. The door guards asked us two questions: “Did you have fun?” Yes. “Did you find great stuff?” Yes on that one, as well. Despite the convention’s flaws, it was more fun than last year’s, and definitely worth attending. 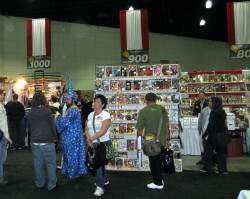 This entry was posted in Comics, Conventions, Photos, Sci-Fi/Fantasy and tagged Heroes, Long, Los Angeles, WizardWorld, WWLA on March 15, 2008 by Kelson. I just read your review and it’s awsome and as for the contest… Well, I really thought Todd and I (Mario and Luigi) didn’t have a chance to win anything. Most of those contestants were great, no doubt about it! Our only hope was to have worked the crowd and get them envolved in our world and be part of it rather than seeing into our world and so we basically worked it really hard. When it came down to just the two of us we went went into action and tried to get the crowd going by acting really goofy up on stage and seeing as how Optimus Prime lost his helmet on stage at one point, we saw an oppurtunity to exploite that and make it look as though two plummbers could fix him up, we had the crowd laughing and I think that was the key for our 1st place win. 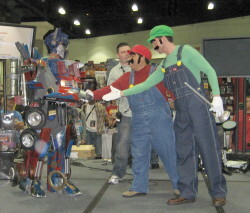 I agree, Optimus Prime was the best costume out there and hands down should have won it. The crowd voted and we couldn’t agrue with that. My hats off to Optimus Prime and we wish him all the best. Pablo, thanks for the comment! You guys did a great job at working the crowd. The funny thing is, I remembered the trying-to-fix-Prime gag, but I’d forgotten that he’d lost his helmet right before! Ahhhh, comics. I was a sickly child and read and reread every Donald Duck comic in the Dr. office lobby….one highlight of my weekly visits. I actually like going to the dentist. It’s that time when I get to read old donald ducks. I really should order them to home but I feel too old. Maybe I’m never too old for that.